iPhone killer? Probably not. Game changer? No doubt about it. Here’s how I fell in love with T-Mobile’s G1 after only one week. Well, sort of. The e-mail from the account director at Waggener Edstrom Worldwide that arrived last Tuesday, began: “I wanted to give you a heads up that I have a T-Mobile G1 review unit for you. I plan to send it out for Friday delivery.” After agreeing to an NDA not to share any information about the device until the 16th, and drawing straws with my co-worker for which one of us would get it first, I realized that I’d be spending the entire weekend with the new love of my life. That weekend eventually became a week, and here’s what happened. When I first received the T-Mobile G1 last Friday, I immediately started playing with it. It’s lightweight and soft-touch matte finish, as well as the ability to open and close its keyboard while holding it in the palm of only one hand, made it feel a lot like a toy. Not like a toy in the way that it doesn’t feel sturdy or solid, but in a way that just makes it feel like an object you desire — and well, that you want to play with. In fact, some of my co-workers felt it looked a little too much like a toy, saying that it appeared plastic and cheap. Well, I get how these iPhone users don’t get its simple design. But surely, it isn’t ghastly. It’s just a little bit on the plain side. And for what Taiwanese mobile phone maker HTC didn’t put into designing its body, Google made up for in developing what’s under its hood. Physically, the only thing that’s really wrong with it, is the little hook or “chin” located at the bottom of the device, that somewhat resembles the bottom half (mouthpiece) of a land-line phone. After flipping up the QWERTY keyboard, the little hook gets in the way of typing, making the device feel a little awkward while typing. Hopefully on the next model they’ll flatten it out, and make the experience of typing smoother. What could be the reason for this peculiar shape in the first place? Perhaps the product team was set on making a design differentiation from both the iPhone and other HTC devices. But it isn’t like that area of the device is entirely useless. It serves as home to operational buttons for making calls, jumping directly to the home screen, using the trackball for directional tasks and selecting, and then a rewinding button for going back a page (or step), and the final button ends a call (as well as serves as the power on/off switch). But even with this little obstruction on the right hand side of the device, typing isn’t quite as bad as it could be considering the position of the keys. Many have criticized that they keys aren’t raised are there’s no virtual keyboard like an iPhone. 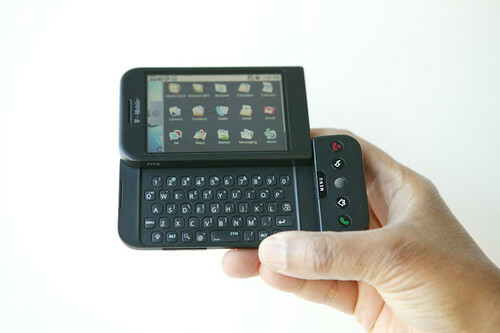 For those who argue against flat keys, they probably aren’t accustomed to using a Sidekick or other HTC devices. If they were, they’d understand clearly that that’s exactly what this experience is like. And for those who complain about the lack of virtual keyboard, well, I’d expect a developer to make that happen as they have on other HTC devices before. Last night, at the G1 launch party in New York, Randy Meyerson, senior product manager, T-Mobile USA, showed me an Android Market app by Shinycore Software, called PicSay, that enables you to add text, graphics, effects, and share it via e-mail, your blog, or photo sharing sites like Picasa, Flickr, and even Facebook, which has quickly become the top photo-sharing site. Even better than Picsay though, Meyerson was excited to show me Android Photostream, a browser and viewer for Flickr, that enables you to put in a username to view a photostream and save the photos to your device, and even use them as your wallpaper. And while other HTC devices offer video recording abilities, the G1 doesn’t. It doesn’t really make sense that a groundbreaking smartphone wouldn’t enable video recording, especially when the smartphone in question comes loaded with a YouTube application. I have to admit, with this phone moving us closer to mobile devices having better and fuller integration with Web services, I had higher expectations for this capability. Listening to music, or using the speakerphone was a pleasant surprise. After listening to the stereo-like quality of the Nokia N95 or an iPhone, it’s hard to imagine that any phone could really sound any good. But the G1’s audio quality is, well, actually, pretty good. At least there’s no ear straining involved. The music player supports MP3, M4A, AMR, WMA, MIDI, WAV, and even OGG Vorbis, and its simple to manage tracks, with sortings by artists, albums, songs, and playlists. In that regard, it’s really no different than an iPod or iPhone. But interestingly, for all the comparisons to the iPhone, using Tmobile’s G1 is a lot more like using a Windows Mobile enabled phone, only better. It’s better because it actually connects you to computing services that you use every day. And the only thing that makes it anything like an iPhone, other than its music management system, is its touchscreen capabilities. At the same time, the touchscreen is entirely different because there is no multitouch capabilities. Yet, the touchscreen is extremely fast and responsive to even the slightest finger fling. Using Gmail, Google calendar and IM isn’t much different than using the same applications on your computer. Once you’ve set up your account, the phone will automatically sync the information from these services for you. Settings can be adjusted to select how and when these applications sync. As well, your address book from your Gmail account automatically becomes your phone’s contacts. If you’re like me, and have 100s or even 1000s of people you’ve emailed over the years, your address book is going to be mammoth in size. This means you’ll end up using search a lot, but it’s a snap with the one-touch search key on the bottom row of the QWERTY keyboard. To save time further, it’s even better to set up groups in your Gmail Address Book so that they’ll be available to you on your phone. As a Mac user, I also use Spanning Sync to make sure all of my Mac Address Book contacts and iCal events are syncing with Google’s services and thereby syncing with the G1 as well. One problem I encountered with e-mail was when I received documents. The system opens everything in HTML view, unless of course the attachment is an image. HTML view worked fine for a Word doc, but not for many other types of attachments. Rating for not being able to save to Google Docs: FAIL. The omission of mobile versions of Google Docs on this phone is definitely going to be a problem for many. That one addition would make it the consummate device, optimal for both work and play. But the product folks I met at the G1 launch party didn’t seem to think it would be long before a developer created an OpenOffice type of application for the Android Market, since both OpenOffice and Android are open source. Google calendar works seamlessly, syncing to your Gcal Web calendar. Google Talk works seamlessly also, and there are also clients for logging into your Aim, MSN, and Yahoo IM accounts. Of course it would be simpler to have just one app to run them all simultaneously as you can with Adium on the Mac and Pidgin on both Windows and Linux. There’ll be a developer fix for that little flaw in no time, I’m sure. All of these IM apps run similarly to how you’re used to them running on your computer, but Google adds threaded conversation views here and even in Text Messaging. Overall, all of these services run pretty fast, though there were some hiccups on non-Google IM apps. Everything on the phone runs a lot faster when connected to a 3G or Wi-Fi network instead of Tmobile’s EDGE. In that regard, YouTube was a bit clunky at first, but once I hit a 3G or Wi-Fi network it was operating at top speed. I found it a little annoying that the YouTube account doesn’t automatically sync with your YouTube account on the Web. There’s no real value to selecting favorites on the phone if you can’t have them transfer to your main account. Setting up Microsoft Exchange on the phone’s Email application required no extra technical skill or knowledge. The only information required to set up a non-Google email account is login info and the mail server. In the case of Exchange on the G1, you’ll have to use IMAP, and there are POP capabilities as well. The G1’s Web browser, for some reason, feels a lot more like a Mozilla browser than it does Google’s Chrome. When on the 3G network browsing is lighting fast. Google search is the default home page and it includes links to Gmail, Calendar, Reader, and More. You have access to Docs, News, Photos, Blogger, Notebook, GOOG-411, and Translate, but all only as Web services and not as usable applications available on the phone. I’ve got the sense that this phone could be a little more fully featured, but I’m not exactly sure what’s missing yet. Sure it’s missing Google Docs and Picasa, and even YouTube synchronization. The beauty of Android though is that developers will come up with solutions to most of these pet peeves that I have. And considering that it’s an open system, fitted to another device other than the G1, we can only dream about what Android could potentially become. Still it feels like something isn’t quite there. On this phone though, it looks and feels a lot like an upgraded Sidekick, Tmobile Wing, or even an HTC Touch. For now, that might be enough. It doesn’t really have to be an iPhone killer, or even a BlackBerry killer, all it has to do is make the experience of mobile computing a lot easier — and that, it does.